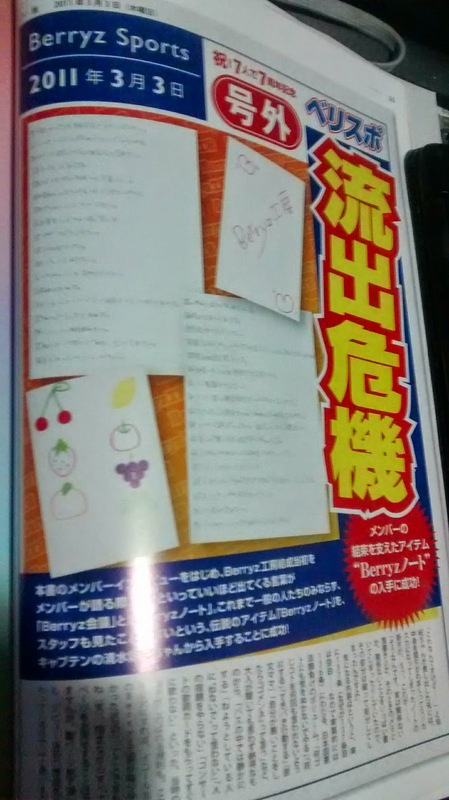 In Berryz Kobo's 7th anniversary photo book, there's a 'news article' on the 'Berryz Note'. To those who aren't familiar with the Berryz Note, it's a notebook that was passed among the members when Berryz Kobo first started out. They also had 'Berryz meetings', where they'd sit down and discuss about the group. Both of these are often mentioned by the members when talking about the early days of the group, and they tend to be credited for keeping the group of primary schoolers in line when they were first starting out. These days, it's in the care of Captain. This is one of the rare looks at it. Speaking about interesting content, it indeed would cover the 137 articles (For some reason, the 137th article is blank...... And so there are 136 substantial articles), a volume that beats even the Constitution of Japan. From entries like 'Whatever it is, do it without losing steam' 'Do things without being told the same thing over and over' 'Act promptly' (as per original), 'If you do something bad, say 『I'm sorry』。', things that grown-ups couldn't help but agree with, 'Keep quiet in buses', 'Do not tell people who are sleeping 「Don't sleep」。', 'Do not do the homework of others', 'Do not immediately sing when you receive the lyrics sheet for a concert', these regulations bring to mind how they were. If they were opposed, that would mean Berryz Kobo would be in a bad state (laughs). Sadly we are unable to show you all the pages, but with the pages you can see, I think you'll be able to experience how they were like when they freshly made their début!